Never avoid the dentist - Pay less now, or higher later! You are here: Home / Dental Articles / You can never avoid a dentist, Never! You can never avoid a dentist, Never! Dentist is one of those persons one would fear about.. and for some it’s a nightmare to visit a dentist. They feel its the hardest part to visit a dentist and have their teeth checked and treated for proper care. Dental fear refers to the fear of dentistry and of receiving dental care. A pathological form of this fear (specific phobia) is variously called dental phobia, odontophobia, dentophobia, dentist phobia, or dental anxiety. The syringes inside the mouth, just can’t me imagined and the pain due to that! Aaarrhhh. Tooth being drilled with motors! How can one imagine a body part being drilled when we are still alive? The instruments and chair for seating the patient! They are scary.. Sometimes its just due to complaints of other patients, one tries to avoid a dentist. Fear of the injection being pointed somewhere else, and side effects of that. Helpless condition. This is something that people experience and they can’t see what is going on in the mouth and this is not satisfactory. Uneasy feeling when anesthesia is given, and patients can’t think what would happen to the anesthetized area after everything is done. I fear the dentist cause it’s been over 10 years since I’ve seen one and it’s going to be messy. Come on people, we too are humans. We know the pain and everything that occurs when treating a patient as we also might have out treatment done once earlier. – The syringes inside the mouth, just can’t me imagined and the pain due to that! Aaarrhhh. Answer – Injections are not to stay for long, just a few seconds and you are done. It just pains in the upper jaw region sometimes, but you know why the injection is given? Its to entirely make you feel the absence of pain. You can bear a few seconds of pain to avoid bigger pain amounts during a treatment that is going to run for an hour. 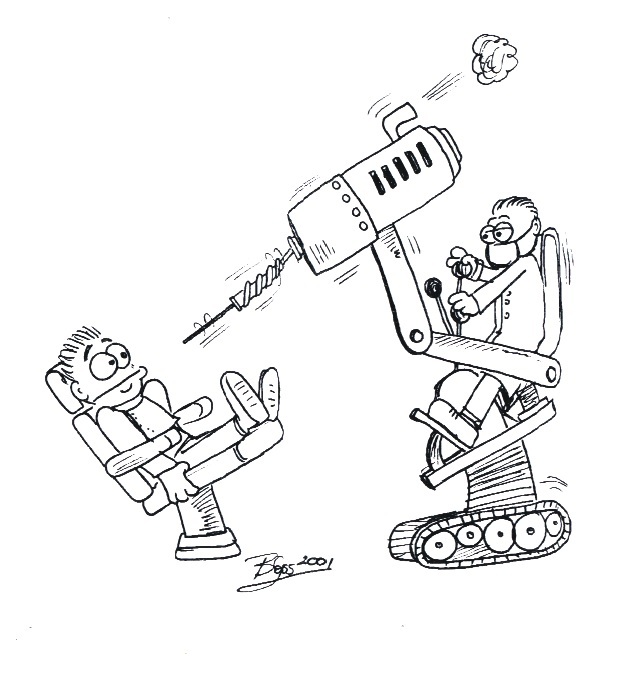 – Tooth being drilled with motors! How can one imagine a body part being drilled when we are still alive? Answer – Did you ever imagine how your tooth would be and how the jaw and parts around the tooth would be damaged, if the drilling and cavity preparation is not done to protect the remaining parts of the tooth? Think about the future, then you won’t fear about the motor drilling at all. – The instruments and chair for seating the patient! They are scary..
Answer – Why do you have to look about all that? Not every instrument is going to be used in your mouth. 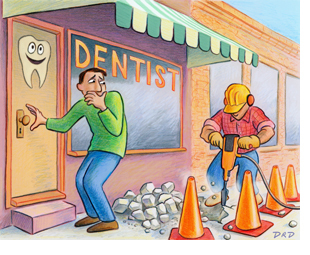 Some people say they are feared of going for a dental examination due to the instruments! But there are very less instruments being used during most of the check-ups until there is a major surgery being done. You don’t at all need to worry about all that. – Sometimes its just due to complaints of other patients, one tries to avoid a dentist. Answer – It always depends on the psychology of the patients, whether to believe the other patient or not. Sometimes the condition of other patient is such that it is painful when treated. The same can not be with you! – Fear of the injection being pointed somewhere else, and side effects of that. Answer – The dentist is well trained for more than 2 years to anesthetize a patient and insert a syringe properly into the patients mouth. Dentist is not a normal person who is new to this and who doesn’t know where to place the syringe. – Helpless condition. This is something that people experience and they can’t see what is going on in the mouth and this is not satisfactory. Answer – Nothing can be said in regards to this. Again a psychological problem which can not be solved easily until you have a positive mind and capacity to overcome this issue. – Uneasy feeling when anesthesia is given, and patients can’t think what would happen to the anesthetized area after everything is done. Answer – The dentists take some preclinical examination and check your general health etc. and make sure that there are no side effects due to the anesthesia or the treatment. – I fear the dentist cause it’s been over 10 years since I’ve seen one and it’s going to be messy. And finally, a small conclusion for you guys! Some of you don’t go to a dentist, thinking about the expenses. A half yearly dental check-up would cost just around $100-$200 for an year, but if you try to avoid that, the slowly occurring tooth decay and other oral conditions will finally lead your way to the dentist, who might be charging thousands of dollars for treating the same. A single root canal treatment can range from $800-$1200 which does not totally give the natural feel of the tooth but just saves that from entirely being removed. So what do you want? A good oral condition which does not require any treatment, or a mouth which is always treated to work properly and which has emptied your pockets to be good in condition? You would never be able to avoid visiting a dentist. You would be visiting them for either preventing any dental condition, or to treat them. So it’s always good to keep visiting a dentist every 6 months, or at least once a year.. although you might not be suffering from any dental problem. Heard of the phrase “Prevention is better than cure?” Follow that, and visit a dentist to know about the new dental problems, and how to keep your mouth and teeth in good condition. This would decrease your future visits to the dentist for any treatments. Do not avoid a dentist due to fear, or expenses or any other reason. very informative article, thank you very much.. There is help – that’s one thing that I hope people with dental phobias will take away from reading your article. Thanks. The dentist, having identified a filing required on both the left and the right side, injected the left side and sent me back to the waiting room to await it taking effect, while he carried out another treatment and therby maximising his earnings. That was some years ago but the effects have lived with me every day and still do. @max, Oh my, we don’t do such practice here, Max. The effect taking of the anesthesia takes just a few minutes, so I would wait beside the patient till that, and continue with the treatment. I won’t intervene a treatment procedure with the other.